Instrumentation: Soprano voice, piccolo, 2 flutes, 2 oboes, 2 B flat clarinets, 2 bassoons, 2 horns in F, tympani, percussion, harp, piano, strings. Recorded/performed at: Ferry Road Studios, ABC, Brisbane, on 27 Nov 92. 1. River-mother, river-child -- 2. Boy and the river -- 3. River nocturne -- 4. House by the river -- 5. Tree of two souls -- 6. Swift tide -- 7. River voices before dawn (Coda). Commission info: Commissioned for performance in a Meet the Composer concert. 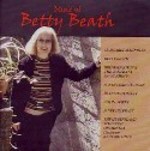 Score: River songs / music by Betty Beath ; words by Jena Woodhouse. 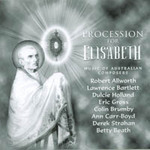 CD: Procession for Elisabeth : music of Australian composers. Parts: River songs / music by Betty Beath ; words by Jena Woodhouse. CD: Best of Jade classics : music of Australian composers.